Our kidneys are very important to us. Without actively functioning kidneys, the presence of kidney disease can be devastating for a person. In the worst case scenario, an individual will need to be on dialysis or receive a kidney transplant to replace the diseased kidneys. 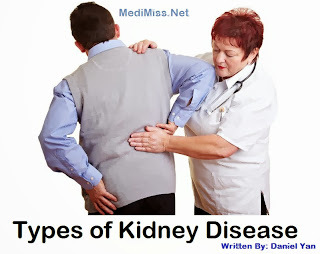 There are several different types of kidney disease, some of which are worse than others. Kidney disease can be "acute", meaning it is of a fast onset or "chronic" meaning the decline in kidney function is slow. Both kinds of kidney disease can be due to autoimmune disorders, toxins, medications or infections. Diseases like diabetes and high blood pressure can gradually worsen the function of the kidneys. Another classification of kidney disease occurs when the kidneys leak out certain body fluids or substances. One of these diseases is hematuria or blood in the urine. This can come from sickened kidneys that leak out blood cells from the capillaries in the kidneys. The other is fairly common and is called proteinuria. Proteinuria is when protein, mostly albumin, leaks out from the body. This can become so great that there is not enough protein in the blood of the rest of the body. We need our protein to keep the fluid in the blood vessels and without it, fluid leaks out into the tissues all over the body. This condition is known as "nephrotic syndrome". The presence of kidney stones is another kidney disease. This can occur when a person secretes too much calcium oxalate into the urine and doesn't drink enough water. Uric acid can cause kidney stones as well. The calcium oxalate or the uric acid builds up in the urinary area of the kidneys and precipitates into a stone that, if passed, becomes very painful. Kidney stones do not fit well in the ureters and they get stuck, causing a back of urine and extreme pain. Infections can occur with kidney stones as well. Hypertension can cause kidney disease or, in some cases, the medications that treat hypertension (high blood pressure) can cause kidney problems. In some cases, a person has a blockage of one or both arteries leading to the kidneys. The kidneys respond by releasing vasopressin which causes the blood pressure to rise remarkably. There are specific blood pressure medications that address this problem. In some cases, surgery to correct the blockage may need to be done. Chronic pyelonephritis is another kidney disease. This is a condition where infection seeds into the kidneys (one or both) and causes chronic pain and inflammation in the kidneys. Hematuria can result from this type of kidney infection. There is one primary kidney disease which is cancerous. Renal cell carcinoma is a type of kidney disease that can occur spontaneously. The cancer can cause pain or bleeding in the area of the kidneys. A CT scan of the abdomen can detect this form of kidney disease. Often, if the cancer doesn't extend beyond the outer capsule of the kidney, the kidney can be removed and the cancer is highly treatable. Kidney disease can be hereditary. There are a number of rare hereditary kidney diseases that result in leakage of blood or protein from the kidneys. These diseases can sometimes be managed medically but, in other cases, dialysis or kidney transplant are necessary to cure the underlying problem.